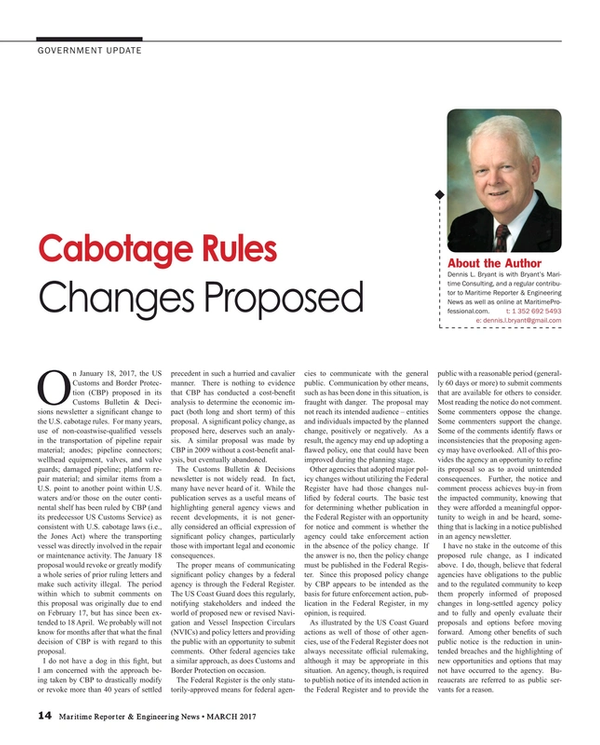 On January 18, 2017, the U.S. Customs and Border Protection (CBP) proposed in its Customs Bulletin & Decisions newsletter a significant change to the U.S. cabotage rules. For many years, use of non-coastwise-qualified vessels in the transportation of pipeline repair material; anodes; pipeline connectors; wellhead equipment, valves and valve guards; damaged pipeline; platform repair material; and similar items from a U.S. point to another point within U.S. waters and/or those on the outer continental shelf has been ruled by CBP (and its predecessor U.S. Customs Service) as consistent with U.S. cabotage laws (i.e., the Jones Act) where the transporting vessel was directly involved in the repair or maintenance activity. The January 18 proposal would revoke or greatly modify a whole series of prior ruling letters and make such activity illegal. The period within which to submit comments on this proposal was originally due to end on February 17, but has since been extended to April 18. We probably will not know for months after that what the final decision of CBP is with regard to this proposal. I do not have a dog in this fight, but I am concerned with the approach being taken by CBP to drastically modify or revoke more than 40 years of settled precedent in such a hurried and cavalier manner. There is nothing to evidence that CBP has conducted a cost-benefit analysis to determine the economic impact (both long and short term) of this proposal. A significant policy change, as proposed here, deserves such an analysis. A similar proposal was made by CBP in 2009 without a cost-benefit analysis, but eventually abandoned. The Customs Bulletin & Decisions newsletter is not widely read. In fact, many have never heard of it. While the publication serves as a useful means of highlighting general agency views and recent developments, it is not generally considered an official expression of significant policy changes, particularly those with important legal and economic consequences. The proper means of communicating significant policy changes by a federal agency is through the Federal Register. The U.S. Coast Guard does this regularly, notifying stakeholders and indeed the world of proposed new or revised Navigation and Vessel Inspection Circulars (NVICs) and policy letters and providing the public with an opportunity to submit comments. Other federal agencies take a similar approach, as does Customs and Border Protection on occasion. The Federal Register is the only statutorily-approved means for federal agencies to communicate with the general public. Communication by other means, such as has been done in this situation, is fraught with danger. The proposal may not reach its intended audience – entities and individuals impacted by the planned change, positively or negatively. As a result, the agency may end up adopting a flawed policy, one that could have been improved during the planning stage. Other agencies that adopted major policy changes without utilizing the Federal Register have had those changes nullified by federal courts. The basic test for determining whether publication in the Federal Register with an opportunity for notice and comment is whether the agency could take enforcement action in the absence of the policy change. If the answer is no, then the policy change must be published in the Federal Register. Since this proposed policy change by CBP appears to be intended as the basis for future enforcement action, publication in the Federal Register, in my opinion, is required. As illustrated by the U.S. Coast Guard actions as well of those of other agencies, use of the Federal Register does not always necessitate official rulemaking, although it may be appropriate in this situation. An agency, though, is required to publish notice of its intended action in the Federal Register and to provide the public with a reasonable period (generally 60 days or more) to submit comments that are available for others to consider. Most reading the notice do not comment. Some commenters oppose the change. Some commenters support the change. Some of the comments identify flaws or inconsistencies that the proposing agency may have overlooked. All of this provides the agency an opportunity to refine its proposal so as to avoid unintended consequences. Further, the notice and comment process achieves buy-in from the impacted community, knowing that they were afforded a meaningful opportunity to weigh in and be heard, something that is lacking in a notice published in an agency newsletter. I have no stake in the outcome of this proposed rule change, as I indicated above. I do, though, believe that federal agencies have obligations to the public and to the regulated community to keep them properly informed of proposed changes in long-settled agency policy and to fully and openly evaluate their proposals and options before moving forward. Among other benefits of such public notice is the reduction in unintended breaches and the highlighting of new opportunities and options that may not have occurred to the agency. Bureaucrats are referred to as public servants for a reason. Dennis L. Bryant is with Bryant’s Maritime Consulting, and a regular contributor to Maritime Reporter & Engineering News as well as online at MaritimeProfessional.com.